Alyz Creations: Cats on a Hat! 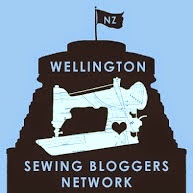 Recently I joined WSBN and found out there was a get together planned soon. 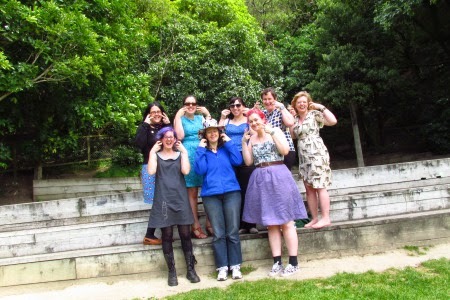 There was also the chance to join the Cat Lady Sewing Challenge that a blogger called Miss Crayola Creepy came up with. Hmmm, what to do/make? Time was limited as I was busy with other projects and LIG (life in general), and the planned picnic was only a short time away. I decided I had enough time to make a hat :) So when I was in Spotty getting something else I checked out the quilting fabrics. As soon as I saw it I thought, "That's it!" I quickly grabbed it and took it to the checkout to get 1mtr. I was on a "run-in-run-out-as-quick-as"
visit since we were on the way to an appointment for Pa, and he was waiting in the car! Probably just as well or I would be sure to see several things I "must have" 8-| I liked it as it was bright and cheerful . . . and then I realised all the cats are wearing hats! Purrrfect! I hunted out an old pattern I used quite a few times for sunhats for my blessings :) Butterick 6614 - it has a well loved look! So here is the result. I'm not keen on photos . . . of me anyway, but then I wanted photos of the hat!!
" Cool! It can be my Mad Hatter cat Hat!" I figure it could be a handy parenting tool - I could threaten to wear it in public . . . with them! A different view - perhaps the best! 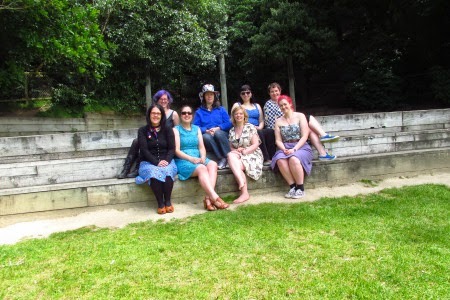 L-R Back row: Laura, myself, Joy, Sandra; Front row: Teresa, Mel, Juliet, Sophie-Lee. Photo courtesy of Laura, taken by her 6yr old daughter - clever girl! I had to leave soon after these were taken as I had to get Brains to a rehearsal. Jo arrived after I left and so more photos were taken. 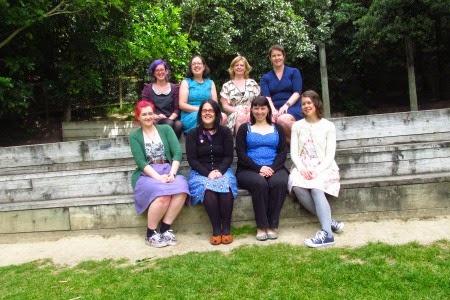 L- R Back row: Laura, Mel, Juliet, Sandra; Front row: Sophie-Lee, Teresa, Joy, Jo. Photo by Laura's daughter.